Sydney Harbour-side glamping with Flash Camp, Clark Island. Glamping is no longer a flash in the pan, with Australia now a virtual tent city of options, from eco retreats to thousand-dollars-plus-a-night glamorous havens such as Longitude 131° at Uluru. But the unstoppable force reinvents itself again: pop-up glamping is the new posh camping. Bedouin on the Beaches is a summer getaway close to the heart of Sydney’s Manly Beach. Ten belle tents will call the grassy grounds of the International College of Management on North Head home. Grassy grounds, coastal outlook: Bedouin on the Beaches. North Head, Manly. Each has its own distinctive Persian rug, quality In Bed linen, and comfortable Australian-made mattress by Hugo Sleep. You can tick the box to be greeted by a combo of Laurent-Perrier Champagne on ice and a tasting board from The Artisan Cheese Room. Breakfast is included, but it’s just a short stroll down to The Boathouse at one of our faves, Shelly Beach. Pick your site somewhere around Victoria’s Mornington Peninsula (presumably with some kind of permission) and then Happy Glamper will ‘pitch, style and pack down a bespoke glamping experience’ complete with fine Manchester and all the sundries you need for a lazy long weekend: books/magazines, mats, board games and chairs. Happy Glamper does ‘standard’ yurts and belles, but its shining star is ‘Peggy Sue’, a vintage Airstream Tradewind caravan. 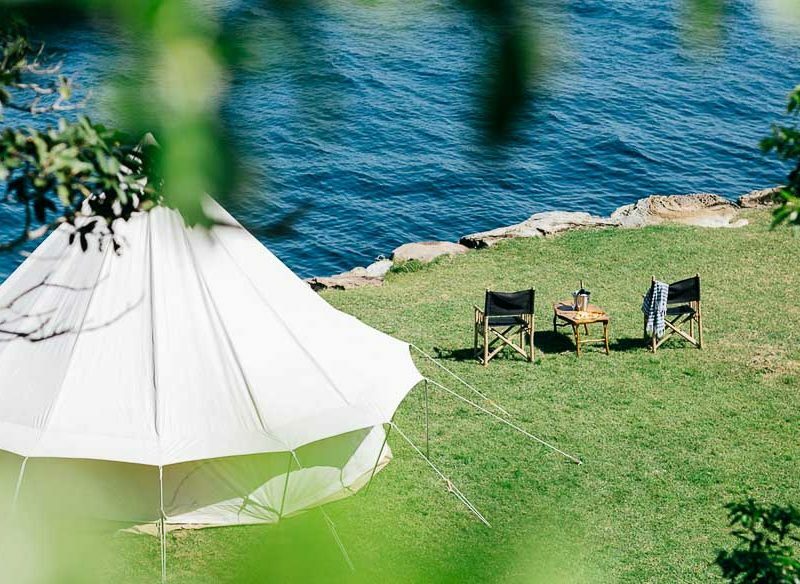 Similarly, Nomadic Belle in Sydney offers ‘luxury tent hire for all occasions’, including weddings and kids’ parties. The possibilities are intriguing. As far as pop-up glamping locations go, coastal is de rigueur, but surely one of Australia’s finest national parks must be worth fleeing the beach for. Flash Camp sets up near Yellow Water Billabong during Kakadu’s Dry Season (July to September), a stunning place for a wildlife cruise, if you feel like leaving your tent. Being in the Wetlands with bamboo furniture, king beds (on pallet bases), Biology Skin toiletries and daily ‘room’ service feels oh-so safari. If you get desperate for civilisation, the large pool and alfresco dining of Barra Bar & Bistro is nearby. 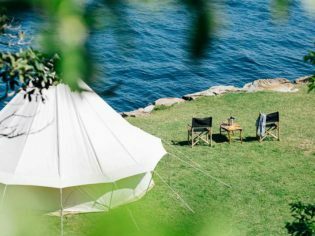 Yes, we are talking about glamping in the middle of Sydney Harbour, on Clark Island, just offshore from Double Bay. Flash Camp will pop up 21 boutique tents early in 2017, but don’t worry, you’re not stranded on the island with nothing to eat, drink or do. The onsite food and beverages will be prepared by the Three Blue Ducks team (with cafes in Bronte, Byron and Rosebery). Stretch out after a hard day soaking in the harbour views on your Koala mattress and Armadillo & Co rugs or head to the communal lounge to network with your glamping neighbours. If you’re like us, the idea of revisiting your festival heydays sounds perfect until the moment arrives when you trudge back to your muddy, mosquito-ridden tent. Festival glamping requires your own private bar (Flash Camp, Splendour in the Grass, Byron Bay). Alas, Flash Camp is catering to festival glampers at events such as Falls Festival and Splendour in the Grass in Byron Bay. You’ll appreciate the extra mile in all the usual glamping extras, but there’s also a powder room for pre-fest preps and onsite massage services for the dreaded day after. If you’re not a festival-lover, Flash Camp is popping up this summer on the cusp of Tallow Beach (a dedicated space near Byron Holiday Park, five or so minutes from town) – with a pop-up restaurant and bar by Harvest.